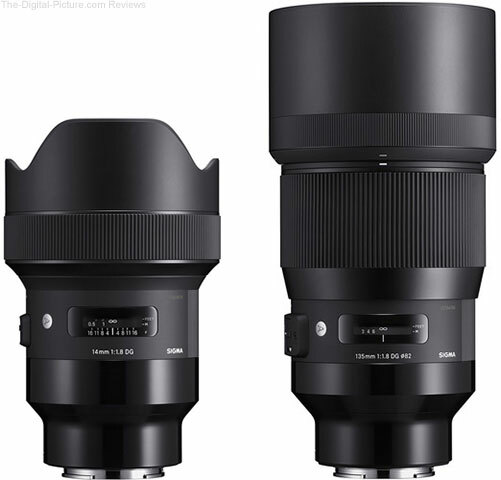 SIGMA 14mm F1.8 DG HSM | Art and SIGMA 135mm F1.8 DG HSM | Art for Sony E-mount are scheduled to start the shipment in July, 2018. While offering the same high-performance optical design as other lenses in the Art line, the new Sony E-mount models will feature a newly developed control algorithm that optimizes the autofocus drive and maximizes the data transmission speed. In addition, these lenses will be compatible with Sony’s Continuous AF (AF-C), which is not addressed by SIGMA MOUNT CONVERTER MC-11. Like the converter MC-11, the lenses will be compatible with in-camera image stabilization and in-camera lens aberration correction, which includes corrections for peripheral illumination, chromatic aberrations, and distortion. * This product is developed, manufactured and sold based on the specifications of E-mount which was disclosed by Sony Corporation under the license agreement with Sony Corporation. Mount Conversion Service is available to convert other mounts of SIGMA 14mm F1.8 DG HSM | Art and SIGMA 135mm F1.8 DG HSM | Art to Sony E-mount. In order to apply for the service, please contact your nearest authorized SIGMA subsidiary or distributor.